IS THE MARINARA SAUCE TIED TO SEAFOOD? WHY SHOULD YOU AIM FOR FRESHNESS? IS THE SPAGHETTI MARINARA RECIPE CHALLENGING? We might have a spaghetti problem. No, seriously. We love pasta sooo much, that we can’t help but mentioning it every time we have the opportunity—and sometimes, even when we shouldn’t. We literally gathered some of the most well-known Italian main dishes, and we still managed to sneak pasta in. But you will forgive us, right? After all, it’s not like we are doing it for no reason, but for ALL THE REASONS. So while this time, we are not writing an article which is 100% dedicated to pasta, it still has very much to do with it and with a very special sauce whose contribution is what makes pasta so delicious in first place. If you think that marinara has anything to do with sailors (marinaro) or with marine life, it’s cute…BUT IT’S WRONG. As a matter of fact, the spaghetti marinara recipe has nothing to do with seafood. No prawns, no oysters. 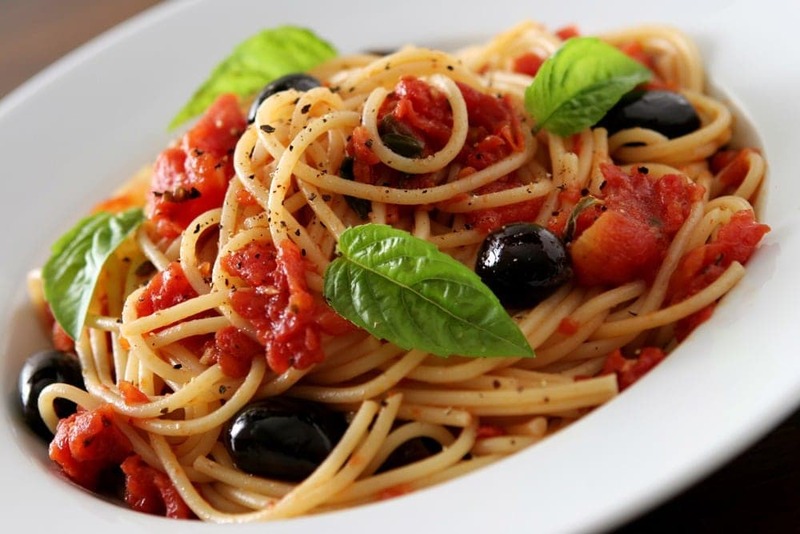 The only thing remotely connected to the sea is the addition of anchovies, but it has no connection to the name of the sauce. We just like anchovies. 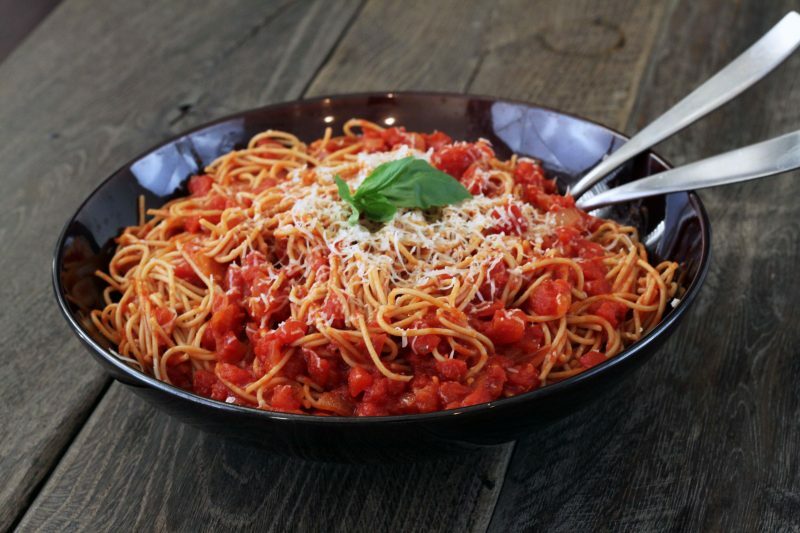 Still, marinara does have a real connection to sailors after all, in the way that it was the sauce the sailors would receive upon their return from their attempt to conquer the seven seas. 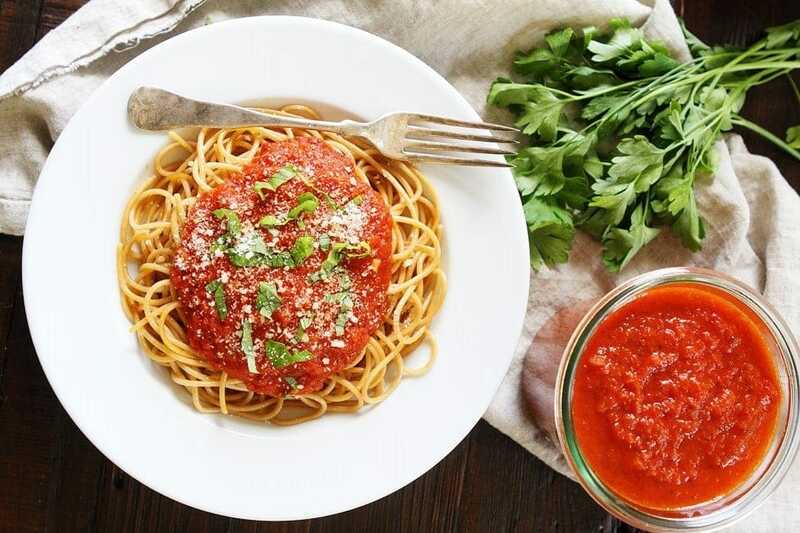 The sauce has its origin tied to Naples and it’s the go-to one for pasta, although the great thing about it is that it can be used with plenty of other dishes. But marinara is just as good as its tomatoes. They really need to be of the highest quality if you want to make the best out of it. True Italian lovers will try to get their hands on the San Marzano tomatoes, directly imported from Italy, but if those are too hard to find (although, psssst!, but NonnaBox might help), it’s best to experiment with different types of tomatoes until finding the right one. And no—we don’t want to hear about canned tomatoes. We like our ingredients fresh and so should you. The spaghetti marinara recipe is anything but difficult. Even though we highly recommend you use fresh ingredients, you shouldn’t be worried by the prospect. Luckily, every single ingredient is easy to find at your local super market. This dish is very tasty and it delights with such an intense and lovely fragrance, that we can’t help but surrender to it. It smells like home—it’s the kind of dish that makes you call your friends and serve them with it. Okay, actually, it might taste SO GOOD, that you will want to have all the bowl just for yourself. 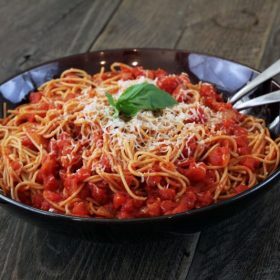 The reason why spaghetti marinara is something special is that it doesn’t quite fit the traditional garlic, oil and hot pepper mold, but gives the spaghetti a change of taste which we will never get tired of. Did we already tell you we love pasta? 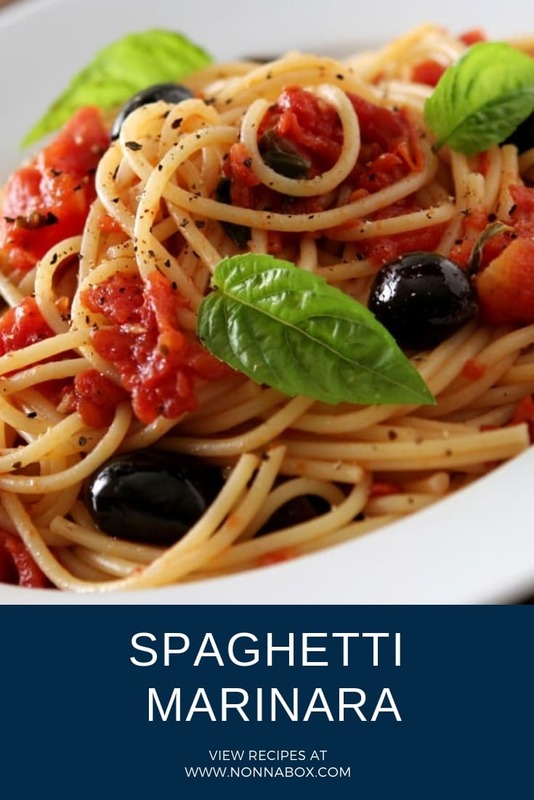 Without further ado, here is all you need for a perfect Italian dinner with our spaghetti marinara recipe. To prepare the sauce, you fry in a pan finely chopped garlic with extra virgin olive oil. Meanwhile, you cut the tomatoes into cubes. Then, when the garlic gets a golden texture, you pour the tomatoes into the pan. You must ensure that the tomatoes liquify well, as the more fluid-y they are, the better it is to dress the pasta with the sauce later on. Let them cook over medium heat for about 15 minutes. You should add the coarsely-minced oregano, to flavor the sauce. At this point, you must put a saucepan with water and salt on the stove and turn on the heat. When it comes to a boil, you throw in the spaghetti. Obviously, the cooking time of the pasta will vary depending on the type and brand that you use. However, this shouldn’t be an issue, as all producers and manufacturers indicate on their label how much cooking time is needed. While the pasta is cooking, add to the sauce the anchovies, capers and sliced olives. When the pasta is cooked, drain it and pour into the pan with the sauce. Put aside for a moment the ingredients and focus only on stirring the pasta. This way, each strand will be well drenched in sauce. After doing this procedure, the pasta is ready. Once you are finished, the Italian way is to pour everything in a large serving dish, placed at the center of the table. This way, every guest can fill their own plates with as much pasta as they want. Don’t forget to sprinkle the pasta with a generous amount of freshly-chopped parsley and black pepper, to enhance the flavor. In order to give the pasta a classier look, you can also serve the pasta yourself shaped as a nest, then add a fresh basil leaf on top of every “nest”. 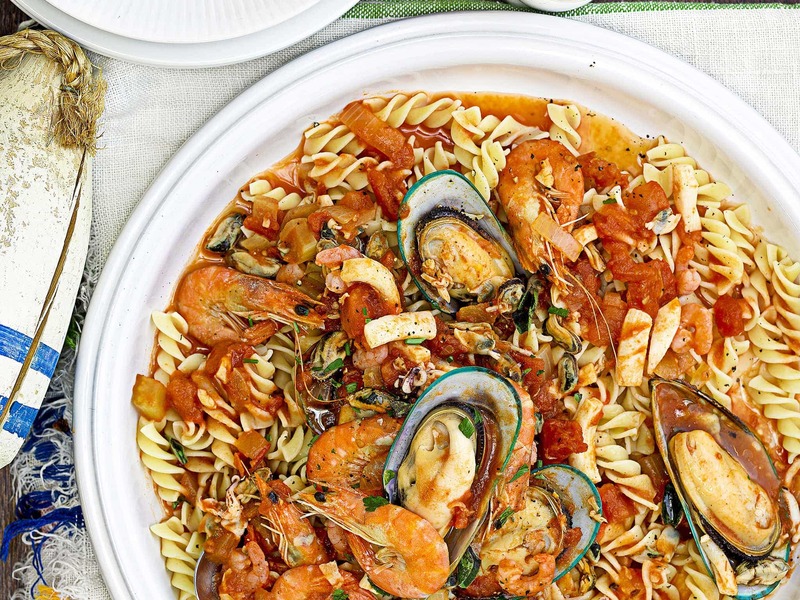 I grew up thinking Marinara Pasta should always have seafood in it. Thank you, Nonnabox, this is a fresh info for me. not a fan of anchovies… so I put in squid and clams instead.. I can eat this everyday of my life! !